Hamel Hostel is a friendly hostel located in the city centre of Havana. Hamel Hostel is very cheap, nice, funny, central, legal, private, large, safe and fresh with capacity for 12 individual beds. 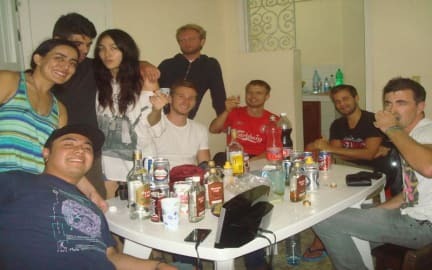 It is perfect for students or backpackers with low budget and wishes to make new foreign friends. All the ingredients for a great stay. Magnolia and all her family will look forward to meeting you and go for new adventures. Hamel Hostel is set on the second floor. It has a shared kitchen with tea & coffee making facilities, a shared living, a refrigerator with minibar and a beautiful and large terrace with view to Havana and Hamel's Alley. Breakfast is served daily, laundry, local maps, luggage storage if you go to other city and city information, currency exchange, taxi, teaching of Spanish and Salsa and bike rental. Only the entrance is shared with the house owner. Magnolia the new house owner speaks a bit of English. Hamel Hostel is well-located in Havana. 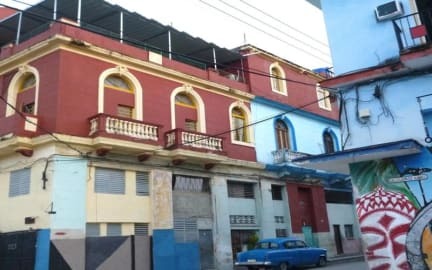 The hostel is located near the University of Havana, Ameijeiras Brothers Hospital, Sea wall (Malecón), The Ramp (La Rampa), The Music House (live salsa), La Zorra y el Cuervo (live jazz), El Gato Tuerto, The Red Saloon (live salsa), The Cabaret Parisien, Chinatown, The Rumba Palace and the Hamel's Alley. Here you can enjoy the rumba, the salsa, the foods, the drinks and the outdoor murals and sculptures about our Afro-Cuban culture. Also there are a lot of shops with cheap foods and other famous night clubs, restaurants, cinemas, museums, theatres and galleries in this zone. Centro Habana is the bridge among the most modern area in the city, El Vedado, and the oldest, Old Havana. Hamel Hostel has two large shared dorms and one private small dorm available: 1th dorm: 6 beds (3 bunk beds, 90 x 190) 2th dorm: 6 beds (3 bunk beds, 90 x 190). They can accommodate a total of 12 people. Bed sheets, linen and a closet with security locker are provided free. The dorms have air conditioning. We have two shared baths with 24 hr hot showers. Curfew is at 3 am. No 24-hour front desk: opening time: from 7 am to 10 pm. Payment types accepted at this property:only cash. Breakfast not included. Extra-cost: 1 CUC per person per day. Curfew is at 3 am. Perfect option for a backpacker on Cuba. It s a great place to be! !i loved it so much that i went back 3times.magnolia and wilfredo are so lovely. The best price in Havana. And the owner (Magnolia) recomends other places to stay in other cities for a best price. It is a little far from the tourist zone (about 3Km from Obispo), so it is possible to eat in places frequented by Cubans, and not only by tourists (I think it's much more interesting! and cheaper too). Very close to malec´ón and bus stop. Hamel hostel is a great starting point for travelling in Cuba. It's sociable and easy to meet to people. The hostel is quite far from then main part of town if planning to walk and there is a curfew at 3am. It's a cheap place to stay and the couple help you find a place to stay in all the main towns if you're travelling onward. Really nice hostel. Great value for money (especially 1CUC breakfast!) very spacious and nice hosts. Only downside is it's a bit far away from the old town and a 3am curfew but overall very satisfactory! Not fancy but good compairing to other options in Havanna. Real value is a nice rooftop that is grreat for socializing (of course, vibe is up to actual mix of guests). 2 bathroom with temporarily available hot water not that much for the number of guests, but for a Havanna hostel acceptable. Breakfast is good and real value for money. Only issue if you wanna have a ling night out, should be last till the morning, as between 3-7 am you cannot enter. Everything is very dirty, beds are old, sheets are even older, but all of this is ok. The worst thing in the hostel is the Staff there is this elderly man that checks you in and he is the rudest person I have ever seen working in hospitality, keep in mind that you have to leave the hostel from 12 to 3 pm as they are doing the cleaning and you can’t stay there. Cleaning that by the Wang doesn’t happen.